Three TRU graduate students whose research will have immediate and important impact on our natural environments have been awarded Environmental Science and Natural Resource Science Fellowships. 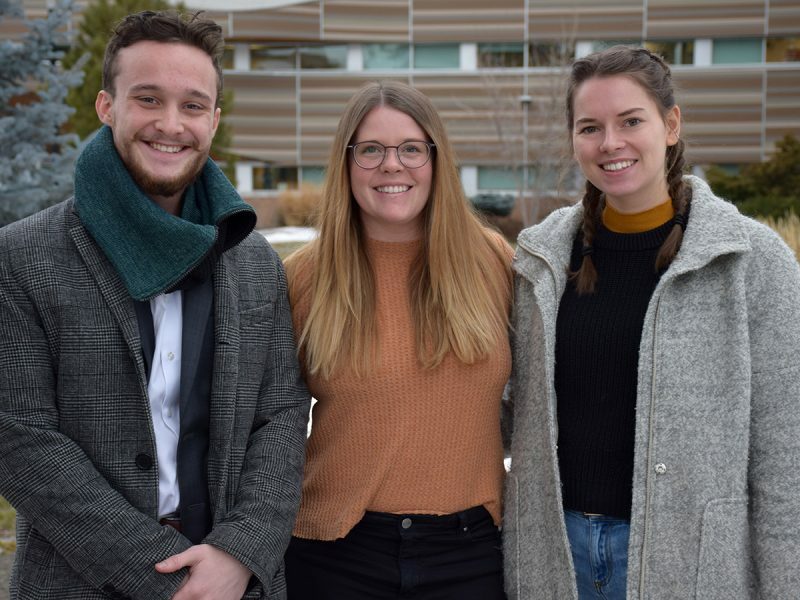 The fellowships, valued at $7,500 each, were awarded to Master of Science in Environmental Science students Dana Eye, Claudie Pageau, and Garret O’Connell. The trio were selected as a result of their commitment to research, and potential for future contributions to their respective fields. Eye, who is studying pregnant female rattlesnakes in Osoyoos, BC, said this fellowship eases the pressure of a demanding research program, and allows her to dig even deeper into her research questions. “This opens up so many other opportunities for us to ask new questions that are really important to the health of this threatened species,” she said. Pageau is studying the evolution of molting strategies of North American songbirds, and results from this research will have direct impact on conservation efforts. Pageau completed her undergraduate degree at the Université du Québec à Chicoutimi, but selected TRU for her graduate studies out of a desire to work alongside Dr. Matt Reudink, associate professor. “This award shows me that people believe in me and in my research, and that is so motivating. I was so, so happy. Learning that I had received this award was a big push for me to continue,” she said. O’Connell is working with Dr. Jonathan VanHamme in TRUGen, an applied genomics lab , where he is studying the biodegradation of fluorinated chemicals by bacteria. These fellowships were generously created by an anonymous donor. Students who receive these prestigious awards are selected based on their demonstrated potential for future contributions to our understanding of the environment.